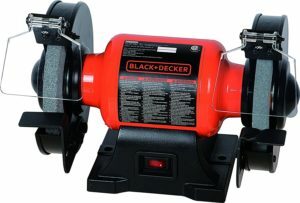 Bench Grinder comes in a variety of configurations and sizes, with the most common options being six and eight inches. Contractors, DIY enthusiasts as well as homeowners will find the 6-inch grinders enough. Let’s discuss best bench grinders. This is achieved with the work light as well as the 2.1 amp motor. The wheels have a diameter of six inches and a thickness of ¾ inches. With a no-load speed of 3450 RPM, you can rest assured of quick material removal. The bench grinder only weighs 16 pounds, which is pretty light. The distance between the wheels is about 12.5 inches, thus allowing you to work on longer grinding operations as well as larger projects. The grinder sits on a heavy-duty cast iron base, a welcome feature given its price range. The ¾ horsepower provides more than enough power to meet the demands of any project. The rugged motor housing combined with the cast iron base also provide increased durability as well as longevity. The WEN 4276 is our pick for best bench grinder for sharpening because it offers maximum precision and visibility. Performance: The WEN 4276 performs incredibly well, regardless of the size of the project. The high speed allows for fast material removal while the motor provides plenty of power for small to large projects. Its lightweight means that you can carry it around when you need to work on contracts easily. The best thing is that you get all of the above without compromising the durability or paying a lot of money. 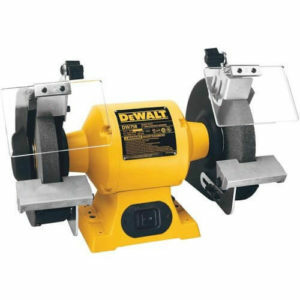 Dewalt is credited with designing and manufacturing some of the best bench grinders for the money and the DW758 is the testimony to that. It features a powerful motor to handle the most difficult tasks. And while some customers complained that the wheels wobble, it’s important to note that the safety features on this model are top notch. The adjustments are easy to do and the model is designed to be very effective. The bench grinder sits on a rugged cast iron base that ensures optimum stability as well as durability. The ¾ HP, 4.2 amps motor provides sufficient power for industrial grinding applications. The motor can reach speeds of 3600 RPM, hence high-speed material removal. The grinder comes with 8-inch wheels and the arbor size is 5/8 inches. Also featured are adjustable tool resets that allow you to position your work accurately. The 12.5-inch distance between the wheels provides enough room for larger and longer grinding applications. The rear exhaust ports ensure that your machine keeps working smoothly for a long time. Like most of their products, Dewalt offers a three-year limited warranty with the DW758. Performance: The Dewalt DW758 will prove a great contender if you need something for heavy-duty grinding applications at an affordable cost. The wheels turn fast and the motor provides enough power to handle all kinds of projects. 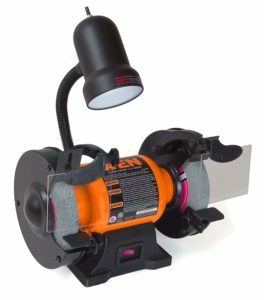 What’s even better is that you get several accessories when you purchase this bench grinder including eye shields, tool rests and sparks deflectors. There is also a user manual to get you started. 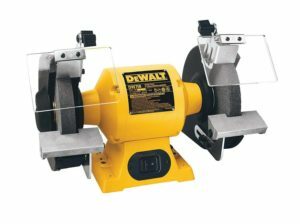 In addition to being sturdy bench grinder, the Dewalt DW756 scores highly for several other reasons. The main ones include a solid built and the 5/8 HP motor, which provides more than enough power for a variety of operations. The favorite feature for many consumers is the base, which is constructed using rugged cast iron for optimum stability and durability. The distance between the two wheels provides ample space for this bench grinder to handle complex projects. The Dewalt DW756 is powered by a 110 V, 5/8 hp, 4 amps induction motor that can handle heavy-duty grinding operations. The ½ arbor size is a welcome feature and so is the 3450 – 3600 RPM speed, which allows for fast material removal. The rear exhaust ports in the wheel guards ensure smooth operations for a long time to come. Other notable features include 28.5-pound weight, a 12.5-inch distance between wheels for longer operations, 36-grit and 60-grit wheels for a variety of applications, tool rests, spark deflectors, eye shields as well as operating instructions. Dewalt offers a three-year limited warranty with this bench grinder. Performance: Overall, the Dewalt dw756 delivers excellent performance when it comes to most home improvement projects. however, you may need to look elsewhere if you need something for heavy-duty tasks. the right thing about this bench grinder is that it’s incredibly easy to use. its quiet operation and durability are welcome features. The right thing about slow speed bench grinders is that they allow you to conserve other tools from the circumstances of overheating. The PowerTech BGSS801 takes the crown for best slow speed bench grinder because it provides the above and more. It has a running speed of 1725 RPM, making it one of the top contenders for those who desire a quieter and smoother operation. It is also ideal where the applications need to be fast, but not so quick that it destroys your equipment. The BGSS801 is powered by a ½ HP, meaning it runs peaceful and provides the best efficiency. Perhaps the best thing about this cool running motor is that it lasts longer than high speed motors. Grinding is a walk in the park, thanks to the one-inch wheels. It is designed for sharpening tools the heavy gauge steel base does a good job of minimizing vibrations. The white aluminum oxide wheels play a significant role when it comes to producing reduced heat. The wheels are 120-grit and 60-grit while the weight is a little on the heavier side at 36 pounds. The 5/8 arbor size is perfect for sharpening wood lathe tools. Performance: It is an excellent tool for quiet operations or when you need to preserve the integrity of other tools by not exposing them to excess heat. The reduced motor speed, motor power, as well as wheel size work together to deliver excellent performance while protecting your tools. 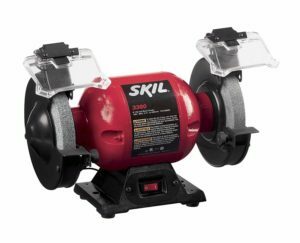 The SKIL 3380-02 is a 6-inch bench grinder that weighs 21 pounds, making it one of the lightest models in this roundup. It features dual grinders on either side of the central motor. 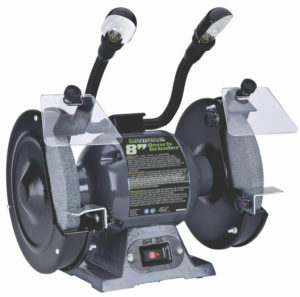 This bench grinder sports a 2.1 amp motor that is particularly powerful for a bench grinder. It provides enough power to solidly press down tools without worrying about slowdowns. Both wheels have a six-inch diameter and are 0.5 inches thick. Also featured is a solid attachable unit with a cord as well as tool rests. Perhaps the best thing about this bench grinder is that it works with various kinds of wheels, provided their measurements are as stated above. You can use buffing wheels as well as wire wheel brushes to pull off the perfect grinding job. The adjustable lamp helps with increased visibility. Performance: This is a good choice as it is capable of getting the job done quickly and efficiently. It is fast and sharpens your tools quite well. A great contender for a variety of applications. This variable speed bench grinder features a quick change system for the wheels that don’t require tools. Its variable speed ranges from 2000 RPM to 3400 RPM, allowing you to optimize it for shaping different kinds of materials. The rubber feet ensure that the grinder stays in place while working, thus preventing wobbling and reducing vibrations. The handy work light proves convenient when working in low light conditions as it improves visibility. You, however, need to purchase a 40 watts bulb. 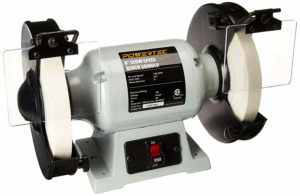 This bench grinder also comes with a coarse 36-grit coarse wheel as well as a 60-grit friable wheel. The heavy duty cast iron base goes a long way towards reducing vibrations. Two safety shields help prevent things from getting into your face while the diamond wheel dresser makes cleaning easy. The shaft has a 0.5-inch diameter and the cord is 6 feet long. This bench grinder is designed for sharpening knives, chisels and other sharp tools. The Delta Power Tools 23-197 is powered by a 120 V, 2 ½ motor with 1/3 horsepower. All in all, it is a bare tool that stands at a height of 11 inches. Performance: This is a great variable speed bench grinder that delivers excellent performance, regardless of the application. It does a perfect job of sharpening your tools and its durable construction guarantees that it will serve you for years to come. Performance: The Portable Cable PCB525BG is truly ideal for sharpening just about anything ranging from drill bits and knives to garden tools and lawnmower blades. The 3-year limited warranty is a bonus. 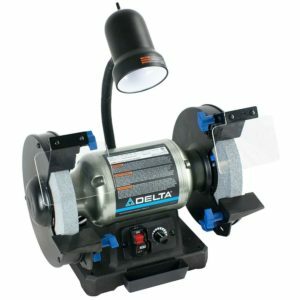 This is an extraordinary, 6-inch bench grinder that is for sharpening a variety of tools ranging from mower blades and knives to garden tools. It comes with 6-inch by 5/8-inch wheels and an arbor size of ½ inches. It weighs less than 15 pounds and comes with two mounting holes for easy setup. This variable speed bench grinder is powered by a powerful induction motor that can be used for more than just sharpening tools. It comes in handy for other tasks like shaping parts, grinding operations, deburring as well as surface preparation. Also notable is that the two wheels have different grits i.e. 36 and 60 for use on various materials. The tool rests are highly adjustable and the right side is specially slotted for sharpening drill bits. 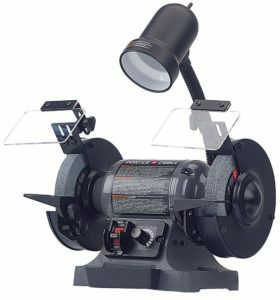 The Sunsex 5002A is a well-balanced bench grinder that will prove worth your money. It features a genuinely versatile work light that does a good job of lowering the eye stress while shining brightly. It comes with two basic wheels at 60-grit for the medium one and 36-grit for the course one. This bench grinder is specially designed to help you with any jobs that come your way and the installing holes are a welcome feature. Notable features include the non-skid rubber feed, which ensures that the bench grinder stays in place. The eye guard is extremely adjustable, thus making projects easier. Also featured are protective trigger guards that secure each of the wheels. These contribute to easier operations. On the issue of measurements, the Sunex 5002A comes with 8-inch wheels. The 36-pound weight makes it one of the heaviest models in this roundup. All of the above is backed by a durable cast iron base and arbor size of 5/8 inches. This grinder is powered by the 5-amp motor at 115 volts/60 Hz. It has a no-load speed of 3450-3600 RPM, which is pretty standard. Performance: This is a tool that you will love having around. The powerful motor, durable construction, as well as high speed, make it a suitable contender for most jobs. Its performance is top notch, considering the price range. Last up on our list of the bench grinders is the Genesis GBG800L, a one of a kind tool that is designed to handle all of your sharpening needs. It is powered by a ¾ HP induction motor that allows for quiet and smooth operation. The two flexible gooseneck lights make it easy to work in low light conditions. 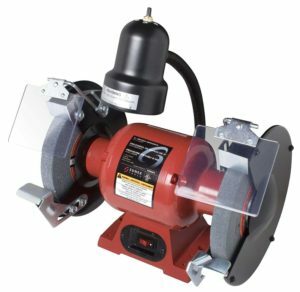 This bench grinder sits on a pre-drilled heavy duty cast iron base that is not only durable but also provides great stability when working. Also included are two bench grinder wheels with different grits i.e. 36G and 60G so that you can work on various materials. Being an 8-inch bench grinder, you can expect to work on larger and longer projects more efficiently than you would with a 6-inch grinder. The arbor size is 5/8 inches and the no-load speed is 3550 RPM. The key to buying a bench grinder is understanding that the best products aren’t necessarily the most expensive. 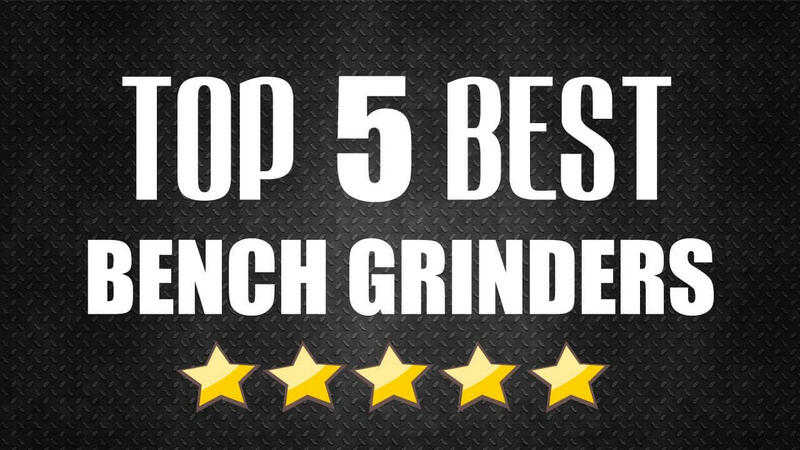 In any case, the top bench grinders are the ones that satisfy your needs. That said, here are a few guidelines to help you with your search. This type of grinder is suitable for small tasks because it comes along with a small wheel, which can prevent you from working on big projects. The 8-inch bench grinders are suitable for completing different tasks. Usually, an 8-inch grinder delivers good value for the money you intend to spend on it. Generally, this type of grinder is a heavy-duty unit, which allows you to clean, sharpen, buff, and polish large items easily. A larger motor has stronger grinding power. You may want to consider something with the most powerful motor you can afford if you will be working on large metals. It’s also important that you consider what you will be using the bench grinder for. This will determine whether you purchase a 6-inch or 8-inch grinder. Of course, durability is important especially if you will be sharpening metals or rusted objects. This is the single most important component of a bench grinder. You have to ensure that your grinder works with the wheel you have in mind. The most common options are wire brush wheels, fine grit grinding wheels, coarse grinding wheels, and buffing wheels. Types of electric benchtop table grinders, machines: variable speed (fast, low or slow speed wheels). There is a pedestal grinder also. The larger option, on the other hand, is quite useful in industrial applications. The 8-inch bench grinders provide two main advantages i.e. faster surface speed and longer wheel life. And while they aren’t the most beautiful tools, bench grinders make for a great addition in your toolbox. It is useful when you need to sharpen something, specifically drill bits. The two wheels have different grits, one for fine sharpening and one for coarse ones. Perhaps the best thing about bench grinders is that they are incredibly easy to use, thanks to a basic motor that comes with a shaft extending on both sides. In this guide, we review everything you need to know about purchasing bench grinders as well as the best offerings on the market. It is important to note that not all of the above are suitable for everyone, particularly because some of them are expensive. One thing is for sure – only the best products made it to this list. The key is to identify your needs and specify your budget range. There was a time when bench grinders were beyond the reach of most people. With reduced prices, increased efficiency and increased number of bench grinders to choose from; everyone can now have what they need without breaking the bank. Whether you are a newbie or have been using these tools for a while, being updated is important. Good luck with your search. I hope you will get the best bench grinder review after reading this article. 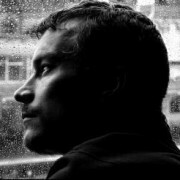 A professional blogger, Writer, and Teacher who love to research online in addition to write reviews. So, that reviews can help the peoples around the world to get their expected radars that value each penny.